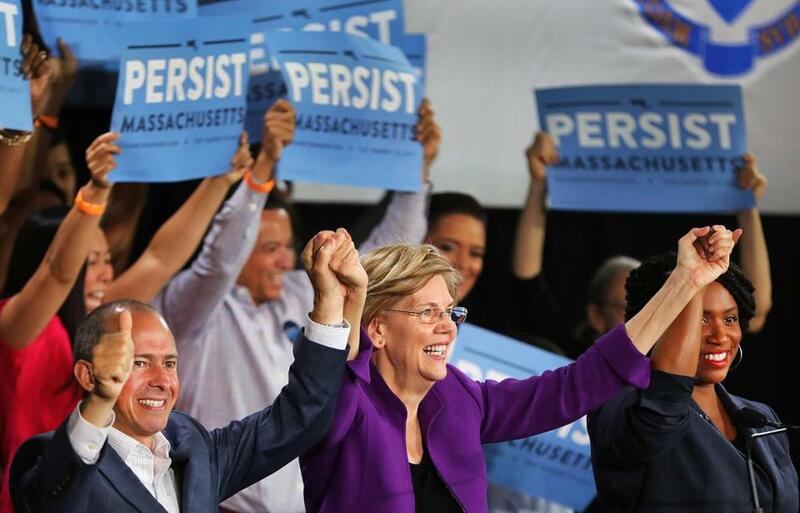 At the end of her speech, US Senator Elizabeth Warren (center) joined hands in support with gubernatorial candidate Jay Gonzalez (left) and US House candidate Ayanna Pressley. CAMBRIDGE — With fewer than 60 days to the November elections, US Senator Elizabeth Warren rallied hundreds of supporters Sunday afternoon by excoriating President Trump and Republican lawmakers, warning him that GOP influence in Washington is coming to an end. Warren, who took the stage at a Democratic “Unity Rally” inside the gymnasium of the Cambridge Community Center, spoke before the crowd dispersed to launch a get-out-the-vote drive. As she spoke, dozens held blue signs bearing the word “Persist” and a scattering of brightly colored rainbow flags rose above the crowd. The Republican challenging Elizabeth Warren is walking a tight line — he pledges to forge a strong working relationship with a president that the majority of Mass. voters oppose. Warren gave her remarks after speeches by several other Democratic officials and candidates, including Boston City Councilor Ayanna Pressley, who is running unopposed for the District 7 congressional seat, as well as Jay Gonzalez, who is challenging Republican Governor Charlie Baker in November. Other speakers during Sunday’s rally included state Representative Marjorie Decker of Cambridge and US Representative Katherine Clark. During the rally, Democrats stoked supporters’ energy with barbs aimed at Trump, who is unpopular with Massachusetts voters. Democratic speakers also emphasized the party’s priorities, including broadening health care coverage, criminal justice reform, environmental protection, support for immigrants, and ending tax breaks that favor big businesses and the wealthy. Bay State Democrats gathered a day after a group of Massachusetts Republicans met in Middleborough for a unity event that was closed to the press. It included appearances by Baker and state Representative Geoff Diehl, who is challenging Warren in the US Senate race. 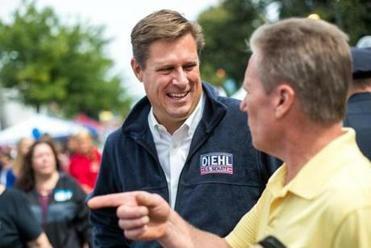 Diehl was a cochairman of Trump’s 2016 Massachusetts campaign, and has pledged to partner with the president if elected. Democrats, especially Gonzalez, worked Sunday to link the crowd’s energy and opposition to Trump and national GOP lawmakers to local races, including his campaign against Baker. Gonzalez also criticized Baker’s endorsement of Diehl because of his support for Trump. Gonzalez, who previously worked as a health insurance executive and cabinet secretary to former governor Deval Patrick, said Massachusetts voters have “lowered our expectations” about the conduct of Republicans in elected office. Gonzalez defeated Somerville entrepreneur Bob Massie during the Sept. 5 primary, but Gonzalez still faces a tough fight ahead against Baker, who has been called the nation’s most popular governor. Pressley, coming off her strong primary victory against incumbent US Representative Mike Capuano in the Democratic primary, criticized Trump and his White House, the source of policies increasingly “draconian, cruel, racist, and shortsighted,” she said. Last week, Trump came under fire from a member of his own administration, who penned an anonymous New York Times column that said administration officials were protecting the nation against the president. Warren told reporters following Sunday’s rally that administration officials must act if they believe Trump is unable to carry out his role. Marisa Lopez, a supporter of the three Democratic candidates, said she’s looking forward to the midterm election. An immigrant from Colombia, the 38-year-old works with low-income, first-generation college students, helping them overcome obstacles in pursuit of their educational goals. Lopez said Warren, Pressley, and Gonzalez each overcame adversity to succeed, and she looks at them as models for the students she works with. Paul McDaniels, 32, of Burlington, said he’s optimistic about the Democrats’ chances in November. “I think the writing’s on the wall, I think you’re seeing hope around the country . . . that has been showing a trend towards a comeback for Democrats,” he said.